Whether you're at work or at home, staring at a computer screen for long stretches can cause eye fatigue. 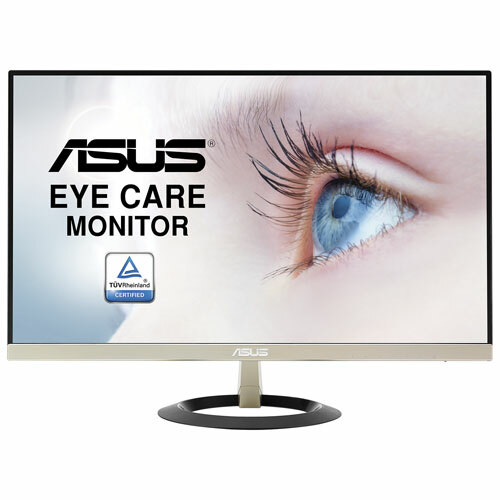 Reduce the strain with this LED monitor from ASUS, equipped with ASUS EyeCare technology that has a flicker-free background and blue-light filter. The slim design and 178-degree viewing angle make it ideal for multi-monitor viewing. I've had this monitor for 3 weeks now and i am really enjoying it. Super thin bezel, crisp colours and very little backlight bleeding. No remorse here. I ordered this monitor on Feb.02.19 and it was at my door Monday Feb.04th. This is the fastest delivery I have ever had. The monitor itself is beautiful quite easy to put together. I ordered this specifically for the eye care feature. I am having some eye issues and thought this was the most responsible choice. Once up and running it is a breeze and joy to use. My reason for 4 stars, the speakers are not very good so I am using the ones I had before, and I have noticed that this monitor gets quite hot so I am limiting my time for now. Otherwise this is a gorgeous monitor, it is so very thin and looks great. I have only had this a couple of days so I may write another review after a few months. Thank you so much to Best Buy for their great delivery service and for a beautiful product! I ordered this monitor on Feb.02.19 and it was at my door Monday Feb.04th. This is the fastest delivery I have ever had. The monitor itself is beautiful quite easy to put together. I ordered this specifically for the eye care feature. I am having some eye problems and thought this was the most responsible choice. Once up and running it is a breeze and joy to use. My reason for 4 stars, the speakers are not very good so I am using the ones I had before, and I have noticed that this monitor gets quite hot so I am limiting my time for now. Otherwise this is a gorgeous monitor, it is so very thin and looks great. I have only had this a couple of days so I may write another review after a few months. Thanx so much to Best Buy for their great delivery service and for a beautiful product! Great monitor! Thin, light, compact for a 21" screen. Runs cool. Fiddled with the colour temperature then realized it had an sRGB mode, so it works well with Lightroom as the secondary screen; matches primary screen very closely. Salesman at Best Buy wasn't sure if it had cables but it does... HDMI, VGA, audio. Great Bargain! I GOT IT ON SALE AND STILL WORKS SOOO SMOOTHLY, CANT BELIEVE IT!!! i replace my old led monitor with this one. this monitor is so great especially for my eyes! great buy, definitely recommend! I purchased this on boxing day, and it was for my new built pc. Everything is good, it even has speakers and is full 1080p. But after less than 2 months of use, Yesterday I turned it on and noticed 2 DEAD PIXELS. 2 Dead pixels, in the bottom left corner. One is right by the bezel, one is about 1cm from the bezel. I'm fine with that, but if anymore form NEAR the middle of the screen I will have to change my review. I'm fine with living with 2 dead pixels, any more NOPE. Afterall its in a corner I don't notice it unless I look REALLY close! Overall I would recommend this, but if more dead pixels form I will change this review. After 3 month of use, the screen is getting off out of the chases at the top left corner. The screen panel is simply glued to the chases and with the heat coming from the LED panel, the adhesive melted down and the screen panel is coming out. I contacted Asus and they processed RMA for me but they mentioned this might be physical damage which is not covered! I am not sure if I will send it to Asus because I do not have much time. NEVER BUY ASUS again. The left upper side of the front panel is coming out of the chases after 4 month of use. I contacted Asus service and I am waiting for the response. The screen is very sleek but this quality issue makes me wondering if it really worth it? The monitor is fantastic for the price. Does speakers are not the best quality but you can expect that from built in monitor speakers most of the time. After about 10 days mine developed some dead pixels however dark spots are covered under the asus warrantee, and if you are still within 30 days of purchase you can exchange the monitor again at bestbuy for a new one, which is the option i opted for. TLDR if youre looking for an inexpensive monitor that is decent quality you found it here. Bought a set of these recently to upgrade my home office. Modern and sleek monitors with sharp and crisp display. Comes with VGA, HDMI, and audio cables. I shopped around, and this was by far the best bang for the buck. I needed a mid-sized monitor with VGA, HDMI, speakers, and a native 1920 x 1080 resolution. It checked all those boxes and did so at a great price. If your requirements are anything like mine, you can't go wrong with this buy. Super Sleek and awesome performance! Got it for a dual monitor set up, worked very smoothly out of the box with easy set up (even came with an HDMI cable so I didn't need to look for my own). Thin and has 4 levels of blue light filtering with noticeable differences if you care about that. It looks nice enough and I am somewhat enjoying it, for the price. I am, however, having issues every few times I go to turn it on where it won't turn on or it says there is no HDMI and I have to fiddle with the cords until the monitor decides to register that they're actually plugged in. The setup was also quite annoying, in my opinion. I don't know why the base needed to come locked, I had to go find an outlet and turn it on before I could set it up (with the monitor facing as far down as it could go, as it was locked in that position). It is stylish and easy to eyes. No complaints so far. Value for money. Got this monitor on sale, but even at full price, this would be worth every penny. Easy plug and play hook up (via HDMI), stunning display. Feather light too! Got this amazing deal and loved the screen. It was very easy to set up but the HDMI is having issues - keeps showing that it's not detecting. It worked couple of times but lately it's not detecting for whatever reason. I would recommend this monitor for sure. For the price of 140 , the screen is excellent. It has great picture and the size is perfect for home - desktop setup or as a laptop extension screen. However, the speakers are really low in volume and not that good. This was my first monitor purchase and it is really good. Be careful when attaching the base to the screen, you will have to tug on the lever arm a bit to straighten it.